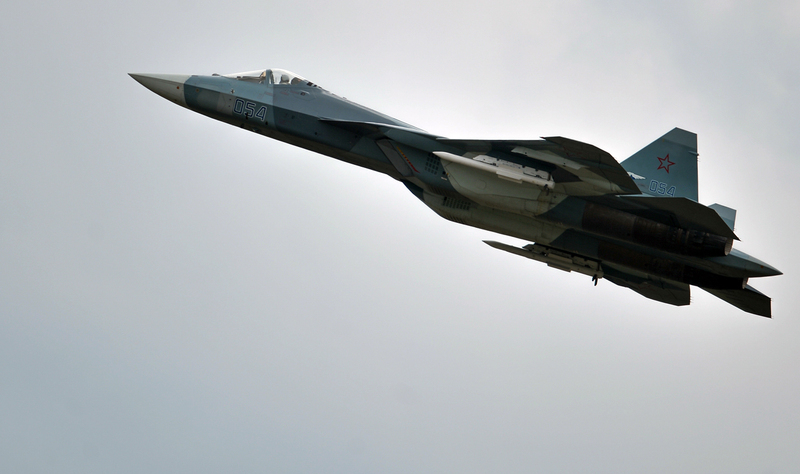 What will 6th-generation fighters be like in the U.S. and Russia? A T-50 airplane during demo flights at the Aviadarts-2015 Flight Skills Competition in Voronezh, Russia. Early development work on a sixth-generation fighter is underway in the U.S. and Russia. Military experts discuss the type of aircraft that may appear in the foreseeable future, and how soon we could realistically expect to see these planes in the skies. “We need to have something by the late 2020s," said Brigadier General Alexus Grynkewich, who participated in the Air Superiority 2030 program, in an interview with Defense News. “I think a realistic timeline is somewhere around 2028 with key investments in some key technology areas, you’d be able to have some initial operational capability of a penetrating counter air capability," he explained. American analysts believe that the future dominance of the U.S. air force will be based not only on one platform, such as the sixth-generation fighter. Most likely this will be a sort of family network of systems. Work on this issue is currently being conducted at the Wright-Patterson Air Force Base in Ohio, where new technologies are being studied and precise NGAD requirements are being developed. The key to success will be simultaneous projects on the development of engines, avionics and weapons, which will then be integrated into the sixth-generation fighter. "NGAD, like other fighter jets, will need to be able to penetrate enemy air defenses and enter contested spaces, but it will also need to be able to operate at greater distances than current platforms," Grynkewich explained. Work on sixth-generation fighters is also being carried out in Russia. Back in March 2016, Colonel General Viktor Bondarev, the commander of Russia’s air force, announced that a sixth-generation fighter was being developed, as well as a seventh-generation one. Afterwards, Vladimir Mikhailov, a representative of the United Aviation Construction Company, said that the sixth-generation fighter would be airborne by 2023. Then, in July, Vladimir Mikheyev, and advisor to the deputy general director of the Radioelectronic Technologies Concern, said that the sixth-generation planes will have space capacities and will be pilotless. This means that they will be able to enter near space and their command will be optional: The pilot can be taken aboard or the plane can fly without him. According to Bondarev, "the possibility of pilotless use is one of the requirements of the sixth-generation fighter," adding that the airplane must know how to "fly at hypersonic speed, be multifunctional, super-maneuverable and unnoticeable." For example, there are many problems with hypersonic planes. The U.S. has repeatedly tried to conduct tests at hypersonic speeds. However, most of the prototypes could not fly for just a few minutes in such a flight mode. "Before speaking about a sixth-generation plane we must first bring the fifth-generation one to operative condition,” said editor-in-chief of Export Vooruzhenii (Weapons Export) magazine Andrei Frolov. “A sixth-generation plane must obviously be developed. However, I would not make any statements about our potential fighter getting into the air in six years, in 2023. We’ll be able to get some kind of model up, sure. But will this be a sixth-generation plane?" he said. Editor-in-chief of Vzlyot (Take-off) magazine Andrei Fomin notes that nothing is known about any type of document determining the plane's conception. "That is why we cannot say now what the sixth-generation fighter will be like – piloted or pilotless, hypersonic or not. For now this is just discussion and preliminary scientific studies," said Fomin.